Tephrocactus articulatus is originally from Argentina. 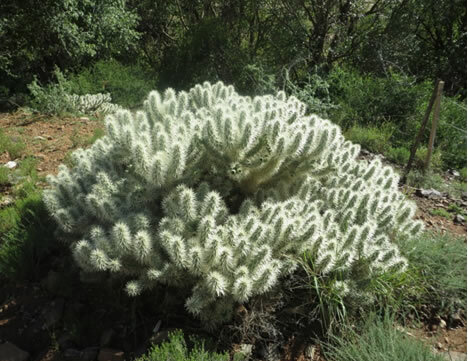 It was introduced in Phoenix the city of Arizona where it has become invasive. 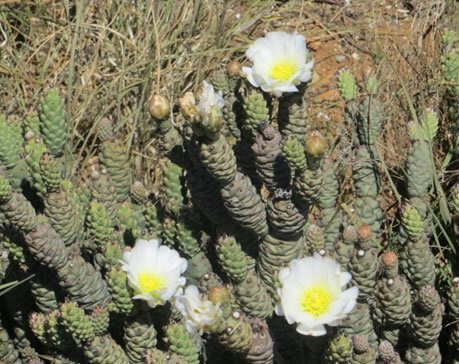 The plant species was probably introduced to South Africa as garden ornamental. This species has a speedy growth rate, an ability to double its segments numbers. It has small spines that pose a significant threat to livestock. This species forms dense stands that are difficult to penetrate, preventing human and stock movement. Dense infestations can replace grasses in rangelands and other indigenous vegetation. The species is a threat to biodiversity, livelihoods, economy and agriculture. Cylindropunita pallida is originally from Texas and Northern Chile. It was introduced to Australia and Spain, where it has become invasive. This species was probably introduced to South Africa as garden ornamental. It has now naturalised from garden escapees. The plant has a speedy growth rate, an ability to double its segments numbers. 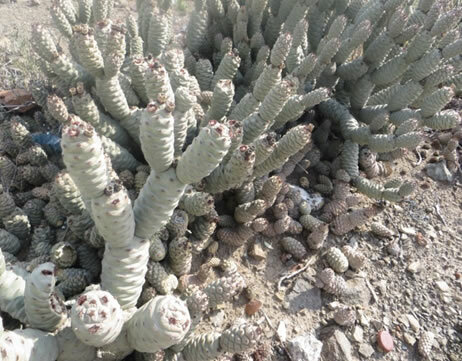 Cylindropunita pallida has needle-sharp spines that pose a significant threat to livestock. Once they penetrate the skin the spines are not easily removed due to tiny barbs on the spines. The plant forms dense stands that are difficult to penetrate, preventing human and stock movement. Dense infestations can replace grasses in rangelands and other indigenous vegetation. The species are a threat to biodiversity, livelihoods, economy and agriculture. The South African National Biodiversity Institute’s (SANBI) Biological Invasions Directorate (BID) aims to identify and address the threat posed by these invasive alien species, which have the potential to negatively affect not just biodiversity but also human livelihoods and economic development. The strategy of prioritising the early detection of emerging invasive species populations allows for effective monitoring of the species. By rapidly responding to emerging invasive alien plant species before they become widespread, costs are kept to a minimum and priceless natural habitats are preserved. The programme is currently researching for these species with the aim to eradicate existing populations. SANBI’s BID has initiated a project to assess the invasiveness of these species and a management plan is in progress. Initial surveys conducted by the team have revealed new populations in the Eastern Cape. The programme is currently implementing a communication strategy to encourage the public to report new sightings of these species. 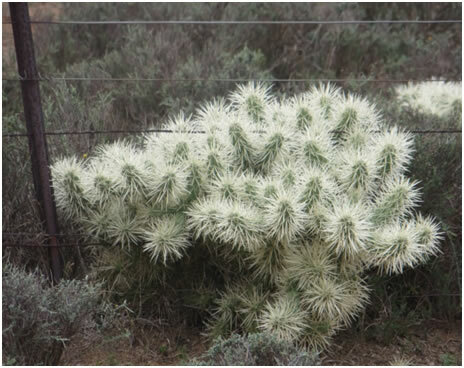 If you see these plant species, please report them to the SANBI’S BID. Please provide us with a locality, pictures, and your contact details. The South African National Biodiversity Institute (SANBI) is mandated to conserve South Africa’s rich biodiversity. Its Invasive Species Programme, funded by Working for Water, aims to reduce the threat of biological invasions through detection, post-border risk assessment and management planning.